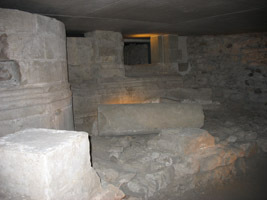 The archaeological excavations under Saint-Peter’s cathedral cover more than 2000 years of Geneva history. Remains of prehistoric and Roman settlements, the corpse of a Celtic chief or saint, important remains of religious buildings erected since the beginning of the Christian period showing the emergence of Christianity during the 4th century, baptisteries and the apse of the cathedral of the year 1000. Every step lets you discover the importance of Geneva in former times. 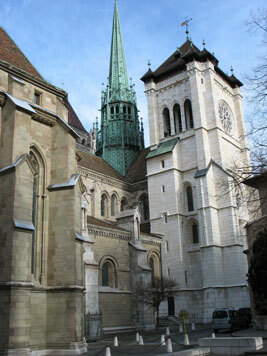 The first bishop-prince of Geneva, Arducius de Faucigny, initiated the reconstruction of the cathedral during the second half of the twelfth century with the help of his Chapter. Its rich decoration dating from the fifteenth century disappeared when the citizens of Geneva adopted the Reformation in 1536. The Greco-Roman façade was added in the middle of the eighteenth century. Once you enter inside its walls, you will immediately feel the “spirit of the age of cathedrals”. Saint-Peter’s cathedral is not the first church on this location. Under the present building, you will discover one of the largest subterranean archaeological sites of Europe. Recently, the archaeologists have probably unearthed the first oratory dating back to the middle of the fourth century.